Starting our day the caffeinated way, Matt and Jason and I ate breakfast at Agua Java. 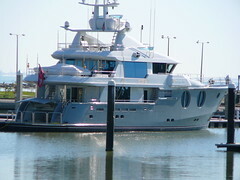 After breakfast, Jason and I took a stroll around the marina to get a closer look at the Calixas 105 moored there. The Calixas is an amazing floating palace of a yacht. If you happen to buy one, give me a tour, ok? The wind on Sunday was light and gusty, probably in the tens. Friday's beginners seemed a bit disappointed. I guess they were spoiled from having learned in 30 Mph winds. For Jason and I it was a nice break from sailing in a hurricane. By the time I got to Worldwinds, the JP 160 I used Friday was already taken. 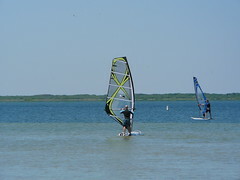 Rather than go back to the 180, I tried a JP 145 x-cite ride and a 5.3 meter sail. The 145 was different from the 160 or 180. I nearly threw the 145 over my head when I went to lift it the first time. The board seemed half the weight I expected. Even in the light wind, it felt like a huge leap in technology. I think I'm in love. Matt and Karen took the beginner class with Angela. 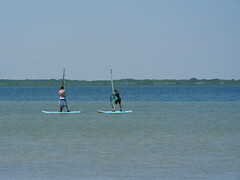 Freddy and Gumbo gave the knee a break by exploring Corpus instead of surfing. The rest of us rented boards. The light winds meant slow sailing, but the occasional gust kept things interesting. As the day continued, the wind picked up a bit. After a few hours, Mike, Jeff, Jacob, and Saruabh got tired of the light wind. They rented kayaks and paddled over to a nearby island to drink some beer. Mike's new friend and her dog went too. Jason and I continued sailing, and the wind actually improved a bit as it got later. I practiced my water starts and cruised around. As the day wore on, a gradual trickle of people drove back to Austin. Matt and Karen, Justin and Freddy were all gone by 3 or 4. Mike, Jason, Jeff, Saurabh, and Jacob stuck around until around 5:30. The remaining crew closed their tabs at Worldwinds while I signed up for a Monday class. Afterwards, we all went to Snoopy's for the final dinner of the trip. 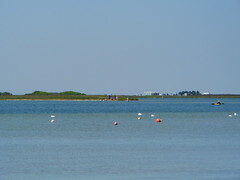 Snoopy's is located on N. Padre island off the turnaround passing under the first bridge off the island. The food was mostly fried seafood, and therefore tasted wonderful. We parted ways once full of seafood, I back to the hotel, they back to Austin. I got a call from Jeff around 11:30pm. Jeff's wallet was missing, and his crew suspected that it had been thrown into the dank dumpsters between Worldwinds and the restrooms. Jeff made the mistake of storing his wallet in a HEB bag which also contained some trash. Someone tossed it so there would be room to stuff 5 people into Mike's car. I agreed to go dumpster diving Monday morning in search of the wallet and the large amount of cash it contained.